This book covers the area of advanced ceramic composites broadly, providing important introductory chapters to fundamentals, processing, and applications of advanced ceramic composites. Within each section, specific topics covered highlight the state of the art research within one of the above sections. 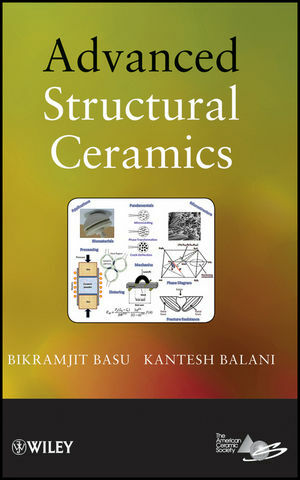 The organization of the book is designed to provide easy understanding by students as well as professionals interested in advanced ceramic composites. The various sections discuss fundamentals of nature and characteristics of ceramics, processing of ceramics, processing and properties of toughened ceramics, high temperature ceramics, nanoceramics and nanoceramic composites, and bioceramics and biocomposites. Bikramjit Basu, PhD, is an Associate Professor in the Department of Materials Science and Engineering at the Indian Institute of Technology (IIT) Kanpur. He is currently on leave at the Materials Research Center, Indian Institute of Science (IISc), Bangalore, India. His research interests include processing-structure-property correlation in structural ceramics, including nanoceramics and nanocomposites as well as biomaterials and tribology of advanced materials. In recognition of his contributions to the field of ceramic and biomaterials science, he has received noteworthy awards from the Indian National Academy of Engineering (2004), the Indian National Science Academy (2005), the Metallurgist of the Year Award (2010) from the Indian government, and the NASI - SCOPUS Young Scientist Award (2010) from Elsevier and the National Academy of Sciences, India (NASI). He was the recipient of the Robert L. Coble Award for Young Scholars from the American Ceramic Society in 2008. Kantesh Balani, PhD, is an Assistant Professor in the Department of Materials Science and Engineering at the Indian Institute of Technology (IIT) Kanpur. His research focuses on the processing and characterization of carbon nanotube (CNT) based biomaterials, energy materials, and correlating mechanics at multiple length scales. He has received several recognitions as a Young Scientist, as well as a Young Engineer, for his contributions in the field of materials science.